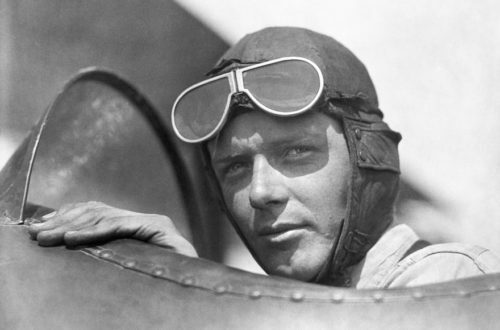 “America First” term “makes many Jews queasy”; Charles Lindbergh used the term — was a leader of the America First Committee — and spoke the truth about Jewish power. DONALD TRUMP is doubling down on his America First policy. 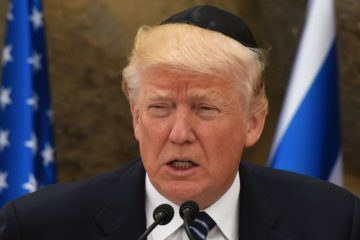 But in a speech Tuesday night following his victories in the last six state primaries, the presumptive Republican nominee for president made clear he’s not about to take the ADL’s advice and abandon the slogan. America First, Trump said, reading from a teleprompter, means protecting American jobs from “unfair foreign competition,” tapping America’s energy resources (including coal), instituting protectionist tax and regulatory policies, loosening regulation, reducing taxes for middle-class Americans and businesses and protecting American workers from immigrants. “It’s important to understand what ‘America first’ means,” Trump said in his speech, as if directly addressing critics of his use of the term. At its core, Trump’s policy shares some elements with the isolationism promoted 75 years ago by leaders of the America First Committee. Created in 1940 after Hitler already had invaded Poland, the America First Committee argued that the U.S. should take a neutral approach toward Nazi Germany, and even do business with it, because the Nazi regime did not threaten America directly. Among its most noteworthy leaders was aviator Charles Lindbergh, who publicly espoused anti-Semitic viewpoints. Lindbergh warned that Jews posed a threat to the U.S. because of their influence over the media, movies and government. The echoes of the America First Committee in Trump’s own America First policy include but are not limited to foreign policy. Lindbergh argued in 1941 that America shouldn’t help Britain because Britain was destined to lose the war and the effort would deplete America’s defenses. Trump says he would not have intervened in Libya to topple Libyan strongman Muammar Gadhafi (though video from 2011 recently surfaced showing Trump endorsing U.S. intervention in Libya) and he opposed the war in Iraq. As Lily Rothman has noted in Time, Lindbergh, like Trump, said he had the backing of a silent majority of Americans who weren’t being given voice by a hostile media. Back in 1941, Lindbergh fingered the Jews as the culprits, saying they were pushing the U.S. toward war through their control of the media. In this year’s campaign, Trump believes the media is against him, too — not because they’re Jews but, he says, because they’re liars. Over time, the America First Committee’s strength waned. Though the movement, in a bid to cast off its anti-Semitic reputation, tried to advance the argument that it was looking out for the best interests of America’s Jews, many moderate isolationists steered clear. Evidence suggests a growing majority of Americans supported U.S. intervention in the war, and the argument became moot on Dec. 7, 1941, when Japan bombed Pearl Harbor. The next day, President Franklin D. Roosevelt called for and received a formal declaration of war from Congress. The term America First cropped up again from time to time after that. In 1944, a group called the America First Party ran a candidate for president; the nominee got less than 2,000 votes nationwide. A write-in candidate in the 1960 presidential campaign also used that party name (winning even fewer votes than the 1944 nominee). And in 2002, a group of activists who supported Pat Buchanan — a man many Jews consider anti-Semitic — broke off from the Reform Party to start a new America First Party. The party was pro-life, anti-gun control and anti-immigration. Its candidates went nowhere. But even without sharing the least palatable goals of the original America First Committee, Trump seems keen on resurrecting a term with notorious baggage. The Origins of the Word "Racism"
Our current era has the potential to be the greatest generation. The history, myself and others have been force fed is coming to a close. Finally, a true history is being recorded.